There’s nothing like a warm, soothing drink when you’re feeling sick. With the colder months slowly creeping up on us, we thought you might want to start stocking up for those sick days. This home remedy contains lemon, honey, ginger, and Best BCAA™ in Lemonade, a flavor soon available exclusively at the Vitamin Shoppe. Lemons contain Vitamin C, a natural immune booster, and may be able to help ease congestion. Honey is a well-known soother of sore throats. Ginger contains anti-inflammatory components that also help relieve sore throats and may even kill the viruses that cause colds in the first place! 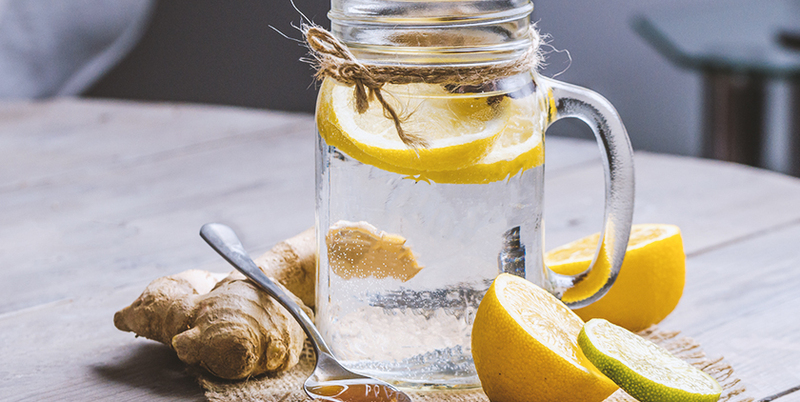 Drink this home remedy with hot water throughout the day and it will help increase your fluid intake, which is one of the best ways to fight off any cold. Slice ginger into vertical strips. Layer the lemon and ginger slices in the mason jar, alternating as you go. Slowly pour the honey into the jar. Allow it to sink down into the layers of lemon and ginger until the jar is filled. Store in your refrigerator. Over time, the mixture will take on more of a jelly consistency. The next time you are feeling sick, just scoop 2-3 tablespoons of this home remedy into a mug full of hot water. Be sure to get whole pieces of lemon and ginger. Add 1 scoop of lemonade Best BCAA™ and stir until combined. Let the hot mixture steep for 3-4 minutes. While this remedy can be made without the addition of Best BCAA™, we’ve added it for a couple of reasons. First, having a cold tends to make you feel fatigued. Aminos are used as a source of energy in your body, but they are different than a stimulant like caffeine in that they won’t make you jittery. Continuing to supplement with aminos when you’re sick may help fight off your weariness without making you feel wired. Second, depending on the type of cold you’ve come down with, you’re likely to lose your appetite. The less you eat, the more your body will search for alternative energy sources. Make sure that it doesn’t turn to your hard-earned muscle. As we said above, aminos are used as fuel, so when you supplement with Best BCAA™, your body will use it instead of breaking down the protein in your muscles for food.